A Terry drawer cabinet with wheels is an excellent solution for those who want additional drawers easily movable in their own room or in their office. From Mister Worker™ you can find several Terry drawer units with wheels, available in various colors to meet the tastes of everyone. 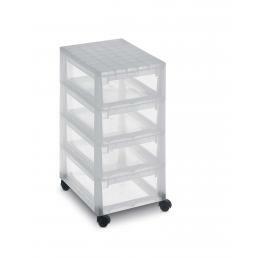 The Terry plastic drawers are made of high quality materials and are very resistant, ideal to keep in your room, in your office or in your own laboratory. They have four swivel wheels, which guarantee an extreme ease of movement and positioning inside the room and which can be quickly detached, transforming the cabinet from fixed to fixed: in this way it can also become a chest of drawers to be inserted into a wardrobe. The four drawers are extractable on both sides and have a height of 13 cm and a capacity of 12 liters: practical and spacious, they are ideal for storing hand tools, documents, stationery and other medium-sized objects. In the Mr. Worker™ catalog you can find all Terry plastic drawers and choose from various colors, depending on your taste and the environment in which you will have to place the drawer. The durable plastic with which they are made makes them ideal for environments where it is easy to hit them, because they resist very well without breaking or cracking.